Now that I have the hardware to measure it, we've added watt hour information to this review. These are from real tests, not estimates based on battery specs. 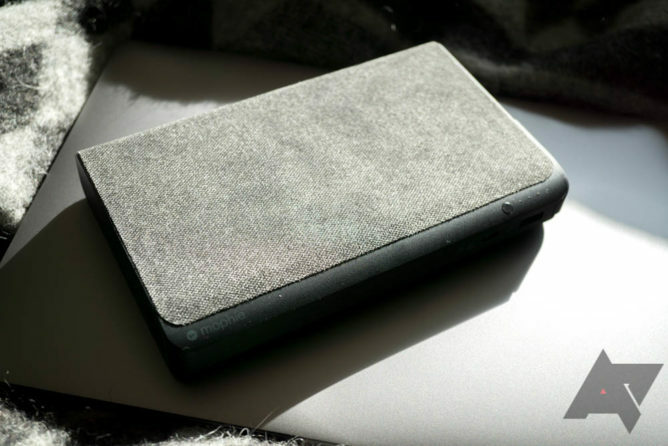 Just ahead of this year's CES, Mophie announced a massive 22,000mAh battery capable of spitting both 30W USB-PD over Type-C and 100W over a standard AC outlet, all in a relatively dinky 7.5" x 4.5" x 1.1" package. It even had what looked like a swanky gray fabric shell, so our interest was certainly piqued. The only real potential drawback we noted at the time was the price. $199.95 is pretty serious cash for a 22,000mAh battery. Since then, the battery has been marked down to ~$125 on Amazon. 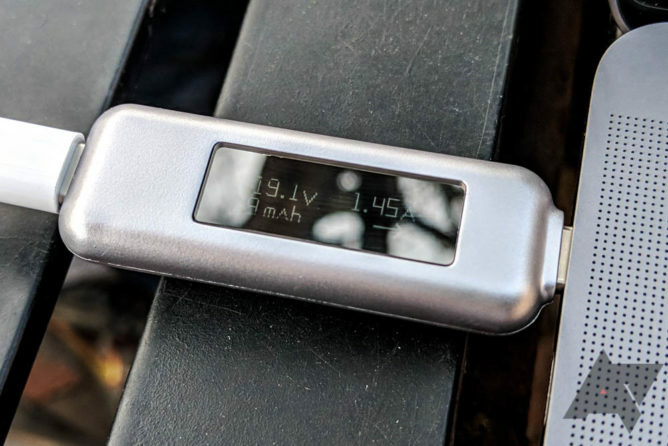 Now that I've had a chance to play with one for a while, I can say that it's a great battery, but depending on your use case it might not be a great value. 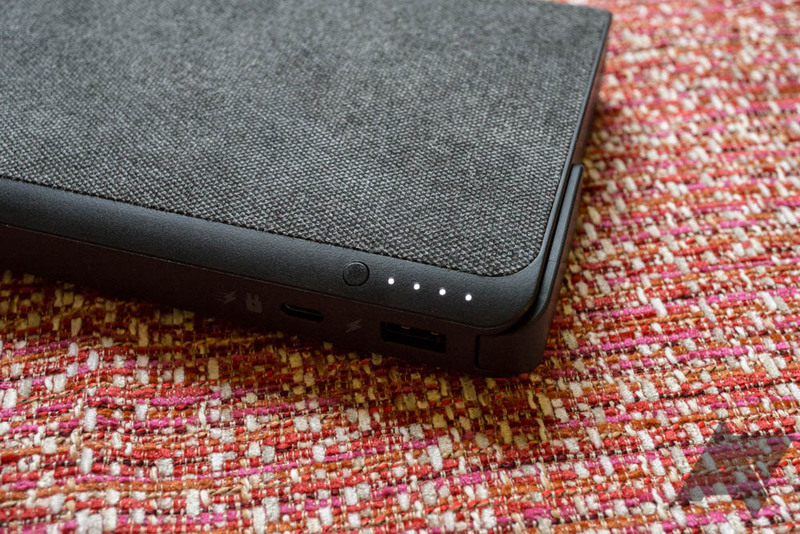 There's nothing wrong with Mophie's Powerstation AC, per se. In fact, the only faults I found in regular use are entirely subjective—I didn't like the fabric. But when comparable 30W USB Type-C batteries go for $60, and you can get a battery with a 100W 110V AC outlet and more capacity for a similar $129, you might wonder why anyone would choose this. The most significant advantage is that it combines each of those two aspects (30W USB Type-C PD and 110V 100W AC) into one convenient package, but it's worth remembering that many people probably won't need both of those features in a 22,000mAh battery. If you do, though, this is the battery for you. 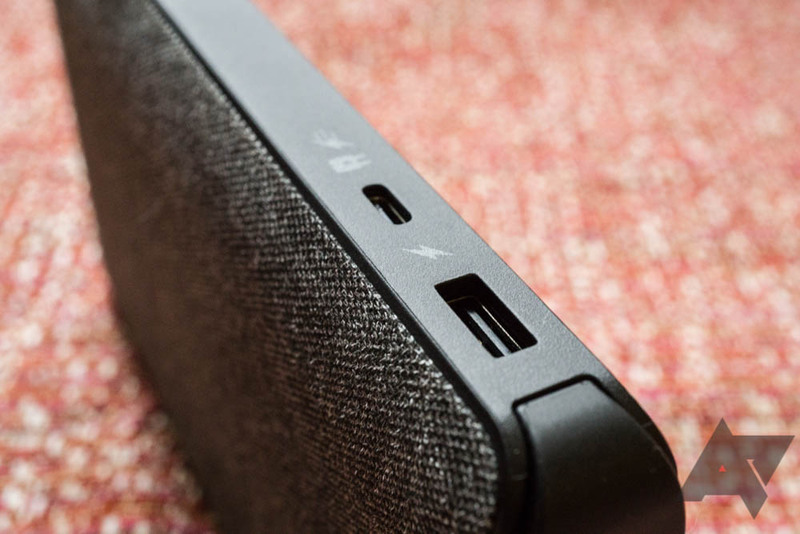 Mophie's Powerstation AC is a good battery, but maybe not for everyone. Outputs 100W 110V GFCI protected AC, USB Type-C PD (up to 30W out), 2.4A "Quick Charge" USB Type-A (note, not Qualcomm's Quick Charge). Pass-through "Priority+" charging tops up connected devices before charging itself, if plugged in. Powerful output The battery spits a lot of power. Just the 30W USB Type-C is probably enough most of the time, combining it with the AC outlet is overkill (in a good way). Powerful input It can also pull a lot of power, charging itself back to full in less than three hours. Build Quality It's attractively designed when so many batteries aren't. Size It's big, but it's not that big. These measurements are fairly trim for the specifications, and the shape makes it easy to pack away. Materials Not everyone is going to be a fan of the fabric used, even if it's a cool idea. AC Power 22,000mAh isn't going to last tremendously long when using the AC outlet. Price Even with the recent discounts, it's just a bit steep. Port locations I'd prefer if all the ports were on the same narrow edge, it would make it a bit easier to access and use in circumstances when you need a battery, like inside a bag on a plane. 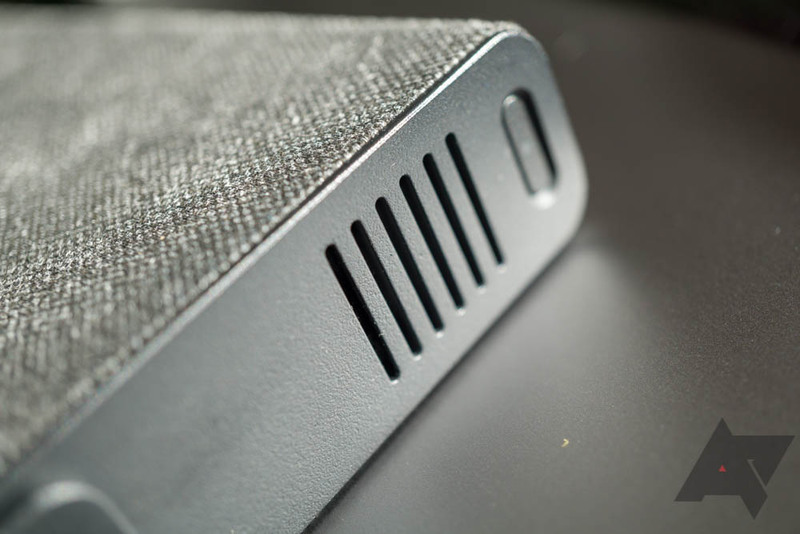 In shape, the Mophie Powerstation AC looks pretty much like every similarly sized battery: a shallow brick. 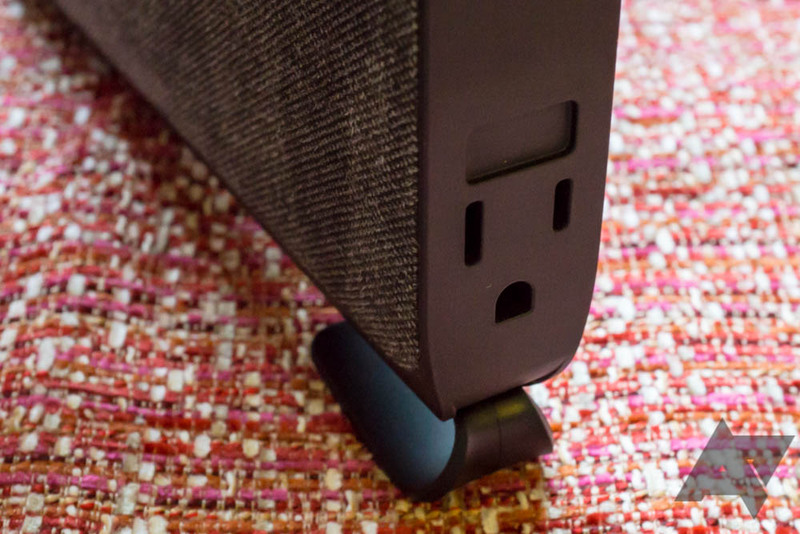 The side with USB ports is slightly tapered, and along that tapered edge is a button that activates four LEDs which show the charge remaining. The 110V AC port is on the top edge next to a fan that kicks on while AC is in use and a button that, when held, activates it. The bottom has a similar vent. I'd really rather have the ports all facing the same direction on one of the narrow sides, as it would make it a bit easier to use the battery when it's packed away inside a bag, but that's a minor complaint. 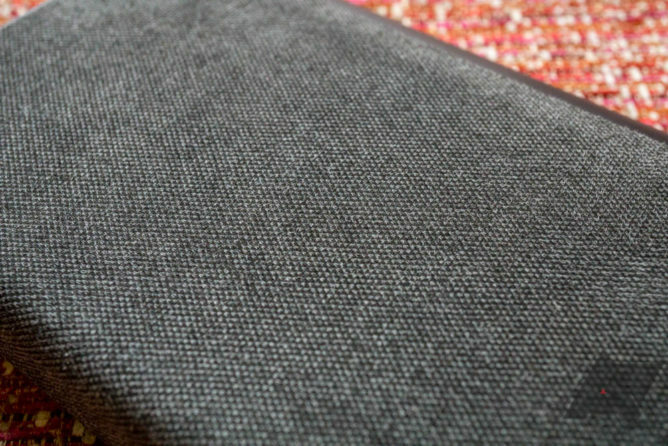 Vertically fore and aft you have a single piece of "Premium Fabric Wrap" that folds over the remaining edge in a single continuous piece. Personally, I am not a fan of the material. I like the idea in concept, but the specific fabric in use here feels like a microfiber-like synthetic. Not everyone will feel the same way, but I don't consider synthetic materials to be very "premium." 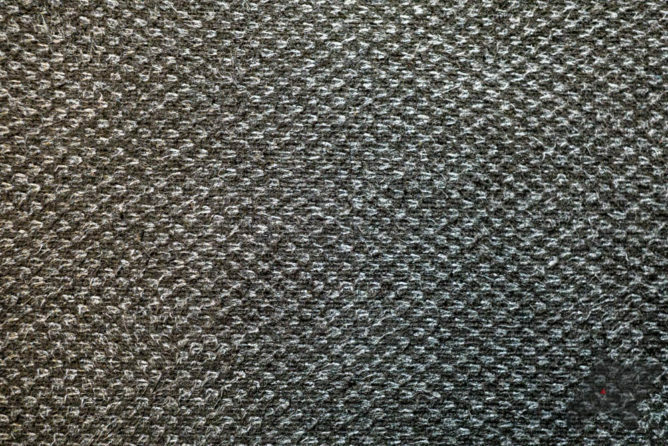 While it looks good, as a big fan of natural materials (my love of linen and quality leather has devolved into a bit of a joke at Android Police) I hate the way it feels. 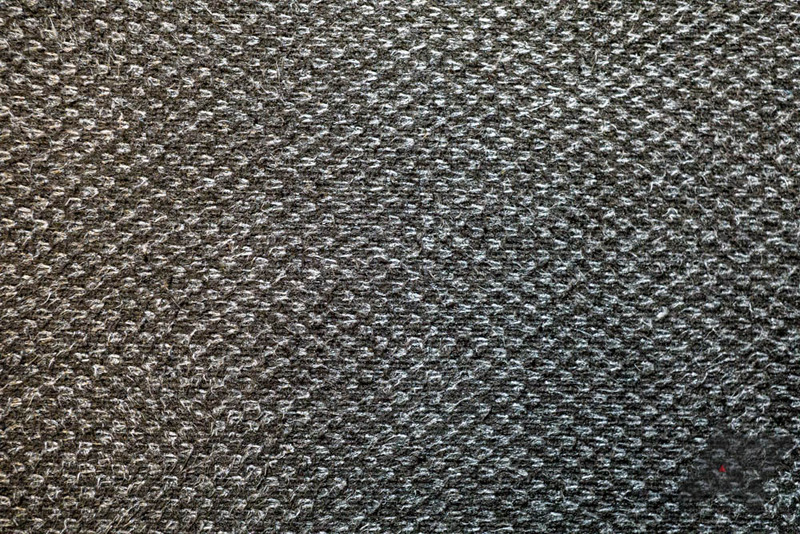 Synthetics like microfiber have a very distinctive texture that can be a bit polarizing. Whatever your preferences are, though, I would imagine that it is easy to keep clean. However, the physical design and materials aren't the most important things when it comes to a battery. What matters most is how well it functions. With a name like Powerstation AC, I expected the battery to deliver some high-powered performance, and it entirely satisfies. 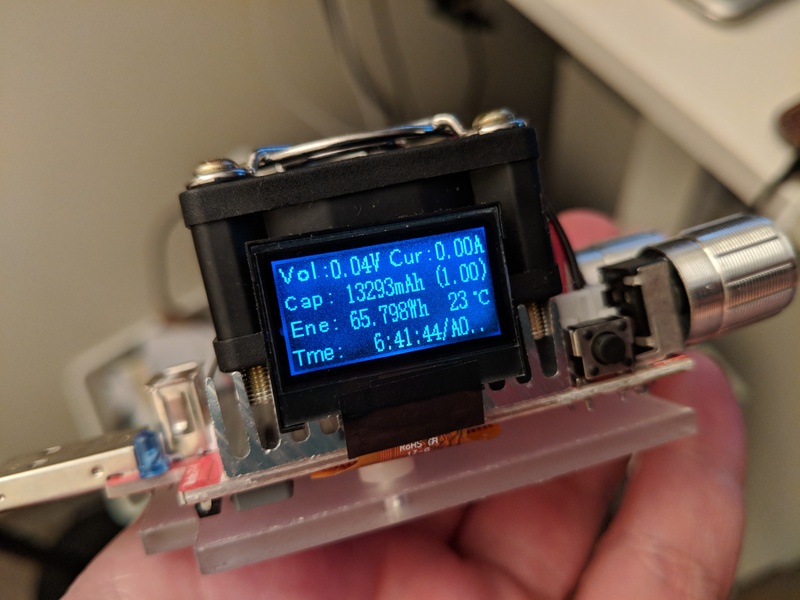 I was able to confirm with our own measurements that it meets advertised specs for 30W PD USB Type-C output, and the AC outlet functions as expected. I used the battery about as intensely as I could, which meant busting out something that needs a bit more power than a phone. The Mophie Powerstation AC is advertised as reaching a max of 30W over USB Type-C, and from my testing, that looks to be true. 30W isn't always enough power for a laptop, but in most normal or light workflows it should be able to keep you powered or slowly top you up. And, of course, it's more than enough for a phone—although only a few, like the Essential Phone, will actually be able to see anything near the max 30W rate. When you need a bit more oomph, the Powerstation AC can deliver up to 100W over the included 110V AC outlet. I tried it with my MacBook Pro's 60W USB Type-C charger, and so far as it was concerned, it operated as a typical outlet. The only distinction the battery makes between the 110V outlet and the USB Type-C and A outputs is that it isn't always providing power. You have to turn it on separately before you use it, and it automatically turns back off after a period of inactivity. There's also a hierarchy of power present. If the AC outlet is turned on, it gets priority for power from the battery first. If there's any remaining wattage from the 100W total left, it goes first to the USB Type-C port, and then what remains goes to the USB Type-A port. That means you can use all three ports only up to a combined total of 100W, and all three can be used simultaneously if their total power is below that limit. Of course (and as expected), with only 22,000mAh the Powerstation AC won't provide power indefinitely. In my own tests, though, it was enough to keep my MacBook Pro (plugged in via the AC outlet) topped during some moderately intensive use (Chrome with 20-40 tabs, Photoshop, Spotify, etc.) for most of a workday, with around 1/4 left over to spare. I'll need to do more extensive testing to get precise durations, and my workflow on a given day will likely affect how long things last. Expected battery life will vary based on your own use. 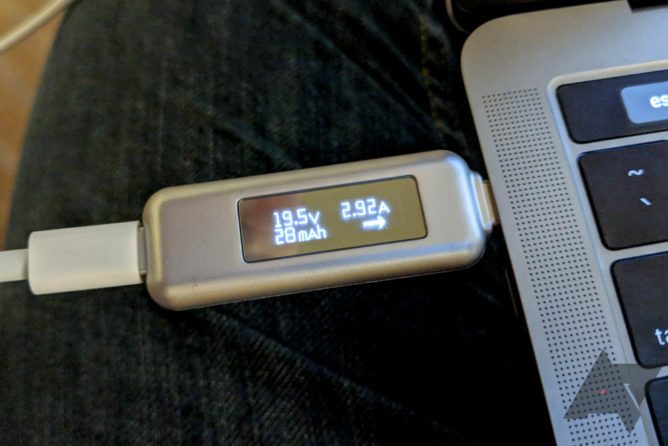 As a point of comparison, I can fully recharge my MacBook Pro's battery a bit more than once (during active use, even), or get about 5-7 more hours of work in. If you are using it with a lower-wattage device like a recent phone, I'd probably expect to get around 3-6 charges from it. But, again, YMMV depending on what you plug into it. Whatever you use it for, the Powerstation AC itself charges very quickly (3-ish hours) when it needs to be refilled, though it's similarly capped at a maximum of 30W for charging. I was hoping to try using the outlet on something slightly ridiculous, like a mini-fridge, but I couldn't find one to use it with. With 100W of power, though, it could probably handle it. Humor aside, the AC outlet is a good reason to recommend this particular battery. Of course, other similar batteries can deliver 100W of output over AC, but so far I haven't found any that can simultaneously match the 30W USB Type-C as well, and certainly none with such an attractive design. Measured via USB-A at 5v/2A the Mophie Powerstation AC can provide up to ~65 Wh of power. Output via the AC outlet may vary due to differences in efficiency for that circuit, but it should give you a ballpark for what to expect. 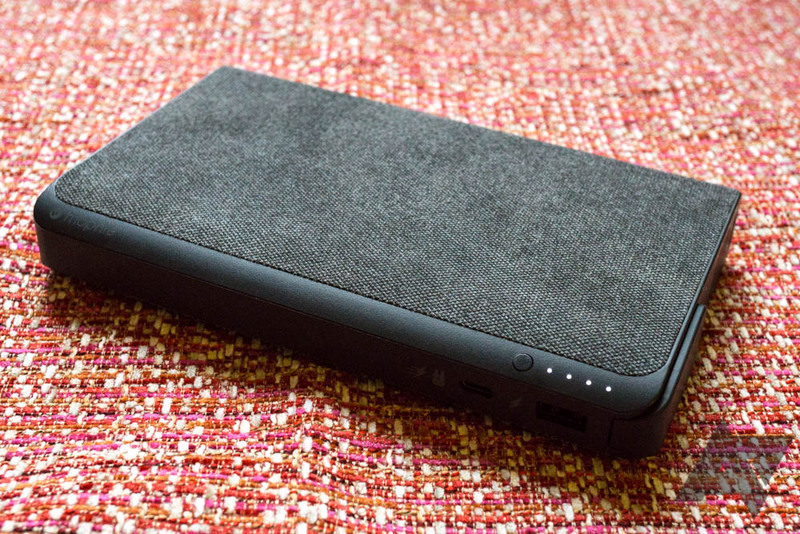 At the $199 MSRP, the Mophie Powerstation AC might be a tough sell. While there aren't any other batteries that precisely match it in specifications, you can get similar performance from more affordable devices, especially if you're willing to compromise when it comes to individual capabilities like weaker USB Type-C charging or the AC outlet. Thankfully, Mophie's new Powerstation AC has already been marked down to $125.65 on Amazon (at the time of writing), which makes it a bit easier to recommend. Even then, it still might not be for everyone. 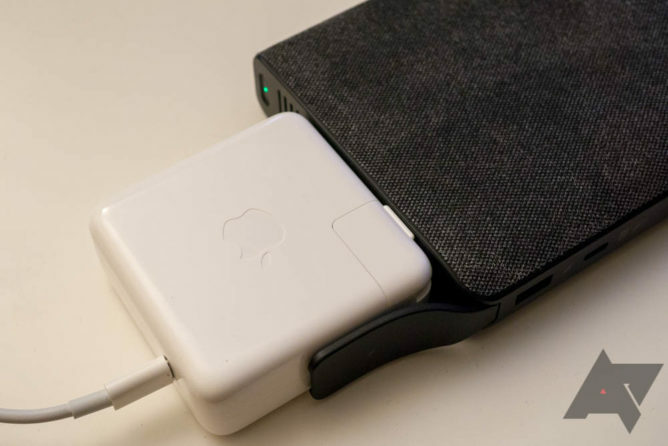 But if you think you might use both the 110V AC outlet and 30W USB PD Type-C charging, or if you're willing to pay a bit more just for the improved design and materials, Mophie's Powerstation AC is a very nice battery.